Please tell me: is this a just verdict? In a hearing on 3 April 2008, the court convicted Hu Jia (胡佳) and sentenced him to three years and six months imprisonment and subsequent deprivation of his political rights  for one year. They also confiscated his laptop computer, his wireless internet access card, his WiFi router, ZTE ADSL modem, an internet access card, one sheet of A4 printer paper with Cai Chu’s (蔡楚) e-mail address written on it, and his PHS limited-range mobile phone. Now let me ask you: if someone in your family got sentenced to three and a half years imprisonment and one year of deprivation of their political rights for writing five articles and giving two interviews, having already been subjected to long term house arrest – would you think that just? And let me ask President Hu Jintao and our various leaders responsible for the administration of justice: given that the Constitution accords priority to the protection of freedom of speech, does a verdict of three and a half years of imprisonment and one year of deprivation of one’s political rights for writing five articles and giving two interviews manifest the ‘spirit of the rule of law’? Does it exhibit the justice of our judicial system? 1. Catch the train of democracy: Wake up, East Asia’s sleeping lion. This was originally a private letter Hu Jia wrote in 2001 to a friend. It is not known who added the title. The court did not actually rely on this article to convict Hu Jia. For when the police questioned the letter’s addressee Wang Lixiong (王力雄) and Hu Jia about it, neither of them could remember anything clearly, due to lapse of time. 3. The two interviews the court relied on for its conviction were entitled Hu Jia comments on the process of Lawyer Gao Zhisheng’s abduction  and Mounting a peaceful challenge to dictatorship. It was said that these interviews given by Hu Jia were produced in the form of audio recordings, and that their content had been edited and the titles added by the interviewer. Freedom of speech is protected by our Constitution as well as by international law. Hu Jia’s words did no harm to society. Instead they helped to alleviate the contradictions between some groups in society and the government. For instance, some petitioners once said that if it had not been for Hu Jia’s help in passing on reports about the wrongs they had suffered, they could only have taken resort to suicide, or even to blowing themselves up together with others. And anyway, at the very least, citizens have a right to criticize the methods of government officials who violate citizens’ rights. ‘I may disagree with what you say, but I will fight to the death for your right to say it.’ (Voltaire). Locking someone up under house arrest just because you don’t like their acrid criticism, and then sending them to prison – who would have thought that it takes a court of law to do that kind of job? Those essays of Hu Jia’s can all be found on the internet. To readers, I suggest that you have a look at them for yourselves. 1. Zeng Jinyan (曾金燕): testified that Hu Jia was using his own white computer to go online. 2. Teng Biao (腾彪): testified that he knew Hu Jia, and that he knew that Hu Hia published essays online. 3. Qi Zhiyong (齐志勇): testified that he knew Hu Jia and that he knew that Hu Jia published essays online, that those essays were sent to the email address of Cai Chu, the Boxun editor, and that the voice on the tape the police gave him was Hu Jia’s. 4. Ye Minghua (叶明华): testified that Hu Jia had once rung him up to ask about the detention of his father Ye Guoqiang (叶国强) by the police, and that Hu had rung him a second time to tell him that he had posted an essay concerning the detention of Ye Guoqiang online on the Boxun website. Let me just remind everyone at this point that while Hu Jia was in pre-trial detention, I was being kept under illegal house arrest and all my contact with the outside world was cut off. The plainclothes police agents at one point illegally moved into my home. They said to me, ‘If you don’t co-operate, we can detain you too.’ The police came to me several times to take my statements, occasions on which they elaborated, ‘if you don’t co-operate we can take you away too; then as a special kindness on our part you may have the child once every three hours to feed it.’ At last, on 12 February, I agreed to have my statement taken by them. The content of my statement is as described above: After Hu Jia was put into detention, Teng Biao was several times threatened with accusations of ‘the crime of inciting state subversion’ and requested to collaborate; his passport was confiscated, plainclothes police abducted and illegally detained him for two days, and he was subjected to frequent house arrests. Qi Zhiyong was forced to leave Beijing by the plainclothes police and had to stay out of town for over one month, after which time he was subjected to further house arrest. Ye Minghua’s father and cousin were formally detained on suspicion of ‘inciting state subversion’ and are currently at home awaiting trial having been released on bail. His uncle, Ye Guozhu (叶国柱), remains in prison, where he is serving his sentence. How can it be inferred from these so called ‘witness statements’ that Hu Jia committed any crime? And from a procedural perspective, I would like to ask everyone in the world – but particularly the legal professionals: is it right to use the statements obtained from witnesses who were subjected to abductions, house arrests, and hostage-takings? Is that in accordance with the claim, made by Chinese government officials, that Hu Jia’s case would be handled according to the principle that ‘all are equal before the law’? 6. Public Security organs provided Hu Jia’s ID and records of his criminal detention. I would like to ask everyone, what do these pieces of evidence prove? Do they prove that Hu Jia subverted this country’s state power? Lastly, let’s take a look at how the court sums up the statement Hu Jia made during his trial on 18 March 2008: ‘At trial, the defendant Hu Jia acknowledged the facts alleged by the prosecution.’ The announcement of the verdict on 3 April 2008 took about 20 minutes altogether and apart from answering the judge to say that he was ‘Hu Jia’, and nodding once in the direction of his lawyers, Hu Jia did not speak another word or make any other sign on this occasion. He did not even seem to notice his relatives. Apart from his mother and myself there were several housewives, students, and strange men – one of whom I saw falling asleep – in the audience. After the verdict had been announced I saw that Hu Jia, looking apathetic, turned around as though he wanted to leave. I called out to him, ‘Hu Jia!’ At that time he was only about one metre away from me, but he did not hear me. Then he was led away by the police. Hu Jia acknowledged that he had written those essays. But that does not mean, of course, that he had committed a crime. True, Hu Jia wrote and published essays for the whole world to read. In doing so, he was only exercising his constitutional right to free speech. The law also gives citizens the right to remain silent during a criminal investigation. But Hu Jia is a human being, not a God whom guns and knives cannot penetrate. During the first month of his detention he was interrogated almost every evening over periods of 6-14 hours. During the day he still had to participate in the activities of the police detention centre, such as for instance each morning’s ‘sitting on a bench’ session, where from 6 am to 12 pm one has to sit motionless on a bench. According to what the state security squad police told me, the so-called interrogations for the most part consisted of ‘doing persuasion and education work’ on Hu Jia, ‘to get him to repent and change his mind so that he could be returned to society sooner.’ Should we call that indoctrination or brainwashing? He could not see any relatives or friends who could give him help and support, and he had barely any opportunities to get fresh air. How could he have been able to show any resistance under such conditions of extreme fatigue and perhaps grave danger to his health? Sleep deprivation and deprivation of opportunities to go out for fresh air all violate Chinese police detention centre regulations. When the announcement of the verdict was over, the judge asked us, the family members, if we had any questions. So I told in detail how Hu Jia has been subjected to illegal house arrest and inhumane treatment, and asked the judge whether these factors had been taken into account. The judge gave an explanation to the effect that it was his professional responsibility to make a decision based on what the prosecution and defence had said, and that what I had mentioned was outside the scope of his professional responsibility. Hu Jia agreed that the lawyers should make a not guilty plea. But he also hoped that the procedure would be over quickly, and above all he did not want anyone else to become implicated in his case. (I think perhaps he was thinking of Lawyer Teng Biao there, because they had jointly published an essay and Teng had already been questioned several times.) 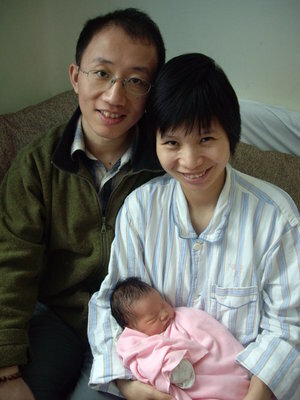 He said to Lawyer Li that he did not want even a minute’s delay; he wanted to get home and hold his baby. He did not disclose any further details about what had happened to him in the police detention centre. He did not say anything, so we don’t know. But there are some things I dare not talk about because I fear that it might lead to further retaliation. They have so many ways of inflicting pain on him without beating him. And that may damage his health even more. As his wife, I hope that he will consider his health and take care of himself. I am terrified. When they said to me, ‘if you don’t co-operate, we can detain you too’ and ‘if you don’t co-operate we can take you away too; then as a special kindness on our part you may have the child once every three hours to feed it,’ I asked myself over and over what I should do. In 1993 when Beijing lost to Sydney its bid to host the Olympics, Hu Jia cried. He was so happy that the Chinese people were finally able to host the Olympics, but he wasn’t hoping for an Olympic Games that would tread on people’s human rights; he was not hoping for an Olympic Games held at the cost of the pain and suffering of weak and powerless ordinary people. He was hoping for an Olympic Games that would really make the Chinese people proud, and that was why he criticized official corruption and called for improvements of the human rights situation, again and again. Now this had landed him in prison. I feel great pain and hopelessness. But no matter what, I will do my best to protect my family, and do all I can to allow Hu Jia to come back home as soon as possible. Who will be able to meet with President Hu Jintao? If you meet the President, please ask him on my behalf what he thinks: was Hu Jia’s verdict just? Appendix: Xinhua News Agency article, English and Chinese versions. Hu Jia was sentenced Thursday by the Beijing First Intermediate People’s Court to three and half years imprisonment, with one year deprivation of political rights, for subverting the state. The verdict said Hu, a married father aged 34 and the holder of a college degree, libeled the Chinese political and social systems, and instigated subversion of the state, which is a crime under Chinese law. Considering Hu’s confession of crime and acceptance of punishment, the court decided the ruling with leniency and announced a less harsh prison sentence. The court heard that from August 2006 to October 2007, Hu published articles on overseas-run websites, made comments in interviews with foreign media, and repeatedly instigated other people to subvert the Chinese political and socialist systems. In his two website articles, ‘China Political Law-enforcement Organs Create Large-scale Horror ahead of CPC National Congress’, and ‘One Country Doesn’t Need Two Systems’, Hu spread malicious rumors, libel and instigation, in an attempt to subvert the state’s political and socialist systems, the court said in the verdict. The articles written by Hu and his interviews were widely relayed by overseas-run websites, the court said. Including the right to free speech under Chinese law. Article 54 (2) PRC Criminal Code. Examples of typographical errors are provided in the original. Directed against those who had wronged them. The statements were taken before the trial and none of the witnesses were allowed to attend the trial. [Note in the original:] The highly secretive persuasion and education session conducted with Hu Jia to make him ‘correct his thinking’ are by no means a new method. The scholar Zhu Hongzhao (朱鸿召) once mentioned to Wu Si (吴思) that in October 1942 a meeting of high cadres of the Northwestern Bureau had the purpose of making certain persons who did not share Mao Zedong’s viewpoint change their mind; the meeting lasted 88 days and it was not dissolved as long as they had not changed their view. (Wu Si, The hidden order – decoding history’s chess game [隐蔽的秩序-拆解历史弈局] at p. 181. Pingback: 了了园 » A just verdict?